Turmeric, or Curcuma longa, belongs to the ginger family and naturally occurs in Southern Asia and India. Turmeric supplements come from the plant's rhizomes, which feature rough, brown skin and a dark orange flesh. Known for its fragrant aroma and slightly bitter taste, turmeric is a common culinary spice in Indian cuisine. Turmeric also comes in liquid extract, capsule and powder forms. The traditional Oriental medicine systems have long used turmeric powder to treat and prevent a variety of medical conditions, from high cholesterol to eczema to cancer. The University of Maryland Medical Center reports that turmeric contains curcumin, an agent that might stimulate the gallbladder to produce more bile. This may help you improve a variety of digestive problems, such as gas and bloating. The curcumin might also effectively treat various inflammatory bowel diseases, including Crohn's disease and ulcerative colitis. The UMMC warns that curcumin sometimes increases stomach acid levels, which means you should not use turmeric supplements to treat stomach ulcers. Early research indicates that turmeric can help lower blood cholesterol levels and keep low-density lipoprotein levels from building up in your arteries, a condition known as atherosclerosis. Keeping your LDL levels low can reduce your risk of stroke or heart attack. Turmeric also keeps platelets from clumping together, which means it might stop blood clots from forming on your artery walls. 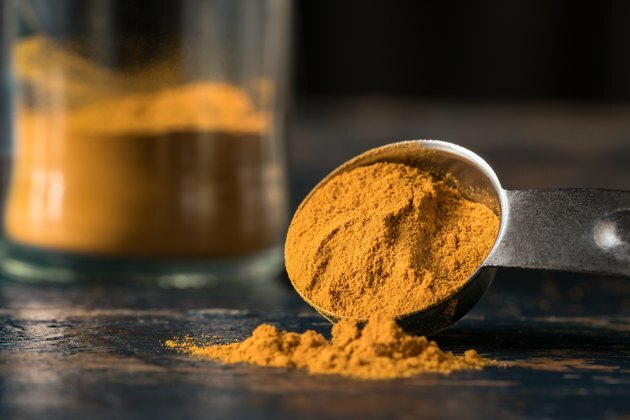 Scientists from The University of Illinois at Urbana-Champaign have discovered that the curcumin in turmeric is an effective agent for killing cancer cells. The team used platinum to make the curcumin more soluble in water, which ultimately makes it easier for the body's organs to absorb. The complex synergy between platinum and curcumin "has proven 100 times more effective in treating various cancer types such as melanoma and breast cancer cells than using curcumin and platinum agents separately," explains Science Daily. Research has also found that curcumin might suppress the growth of cancerous cells by simply inhibiting the blood vessels that supply the cancer cells. Turmeric lowers blood sugar levels in diabetic animals, according to various rodent studies. However, turmeric supplements might also increase the effects of anti-diabetic drugs and increase your risk of low blood sugar, a condition called hypoglycemia. Early studies indicate that curcumin helps to block the formation of the plaque thought to cause Alzheimer's disease. And growing evidence shows that applying poultices of turmeric powder directly onto your skin might help to treat eczema and heal minor wounds. Turmeric's antioxidant properties might even help to stop the inflammation that causes arthritis. Do you currently incorporate turmeric powder and curcumin into your diet? Do you plan to start? Let us know in the comments.